Back in the days when AIDS was ravaging many and there was no known treatment, I became particularly interested in Aloe Vera. At that time there were anecdotal reports of longer survival with the use of certain internal preparations of Aloe Vera. More recently my interest was rekindled as I was searching for help with weight loss when I was going through a now successful personal weight loss program. I added 1-2 teaspoons of liquid aloe concentrate and 1 tablet of aloe concentrate twice daily to my personal supplement program and do feel it made weight loss easier. Having achieved the weight goal, I am still using aloe for the many benefits it provides. Nature has provided us with many healing even miraculous plants. Aloe Vera is a succulent and like all other succulents, is a self-healing plant. I have always grown Aloe in my yard for use on cuts, burns, bites, etc. When a living aloe leaf is cut or torn, it immediately seals the "wound" preventing the loss of water and nutrients and protecting it against bacterial contamination. It takes only minutes for the aloe gel to begin seeping out to the surface and forming a water-tight, rubber-like coating over the injured area. As the gel coating begins to dry it contracts, pulling the edges of the wound shut. The wound heals completely within days & leaves no scarring. When aloe vera is applied topically to a wound it forms a seal over the damaged skin. This helps to stop the bleeding, protect against wound infection, provide essential nourishment to the traumatized tissues, stimulate the regeneration of skin cells and connective tissue, and accelerate the healing process. Aloe Vera gel also alleviates inflammation and swelling. Stone carvings depicting the Aloe Vera plant show it was used in early Egypt. It was known as the “plant of immortality” and presented as a burial gift to deceased pharaohs. Aloe was one of the most frequently prescribed medicines in the 18th and 19th centuries and today in the U.S. it is one of the most commonly used herbs. Aloe is mainly grown in the dry regions of Africa, Asia, Europe and America. There are over 240 different species of aloe. The Aloe Barbadensis Miller (commonly know as Aloe Vera) has the most nutritional & healing value. Although scientists have discovered over 150 nutritional ingredients in Aloe Vera, there is no "single" magic ingredient. They all work together in a synergistic way to create healing and health giving benefits. The Aloe Vera leaf contains over 75 nutrients and 200 active compounds, including 20 minerals, 18 amino acids, and 12 vitamins. AMINO ACIDS: These components of protein are literally the building blocks of the body. Eight of the essential amino acids cannot be made by the body, but are found within the aloe plant. As well as in protein food items. The following is a list of the amino acids found in the aloe plant: Isoleucine, Leucine, Lysine, Methionine, Phenylalanine, Threonine, Valine, Tryptophan, Alanine, Arginine, Asparagine, Cysteine, Glutamic acid, Glycine, Histidine, Proline, Serine, Tyrosine, Glutamine, Aspartic Acid. VITAMINS: Since the human body cannot store some of vitamins listed beow, it is necessary to supplement them through our diet. The following is a list of the vitamins found in the Aloe Vera plant: Vitamin A, Vitamin C, Vitamin E, Folic Acid, Choline, Vitamin B1, Vitamin B2, Vitamin B3(niacin), Vitamin B6, Vitamin B12. MINERALS: Adding naturally occurring vitamins and minerals to our diet is important for overall health. This is a list of the minerals in the aloe plant: Calcium, Magnesium, Zinc, Chromium, Selenium, Sodium, Iron, Potassium, Copper, Manganese. ENZYMES: Run your entire body & without them you would not be able digest or absorb food. For more about the critical functions of enzymes see my newsletter on this topic. ANTHRAQUINONES: Are important phytochemicals (natural plant compounds) found the sap of the aloe vera plant. Small doses appear to stimulate digestive secretions, bile flow, and the upper digestive system, while large doses can have a laxative effect. They have been linked to aloe vera's anti-inflammatory, antimicrobial, antioxidant and free radical scavenging properties. LIGNANS: Are dietary fibers that stimulate digestion. They work as carriers for other important substances by binding them and transporting them into even deeper skin layers.Aloe Vera is the only known substance which can penetrate the dermis layer of the skin. MONOSACCHARIDES & POLYSACCHARIDES: Are proven to have anti-inflammatory, antibacterial, antiviral, anti-fungal and immune-stimulating effects. They enhance digestion, bind a number of dangerous substances such as cholesterol and gall acid preventing them from entering the bloodstream. The saccharides found in aloe vera are: Acemannan, aldopentose, arabinose, cellulose, galactose, galacturonic acid, glucoronic acid, glucose, hexanoic acid, mannose, mannuronic acid, pentosan, rhamnose, uronic acid, and xylose. SALICYLIC ACID: Possesses anti-inflammatory and antibacterial properties. It also works as a pain killer, decreases fever and stops inflammation. Salicylic acid is a popular and well-recommended treatment for acne, psoriasis, keratosis pilaris and other skin conditions. SAPONINS: Have a cleansing and anti-septic effect. These substances are very important for the destruction of bacteria, virus, fungi and yeasts. FATTY ACIDS: Such as Sterols which chemically resemble cholesterol. This allows them to travel through your digestive tract, where they prevent real cholesterol from being absorbed into your bloodstream. Sterols have been shown to inhibit the absorption of cholesterol in the small intestine by up to 50%. This can lower LDL cholesterol by 14% or more. Aloe Vera also contains the fatty acids: Linoleic, Linolenic, Myristic, Caprylic, Oleic, Palmitic, & Stearic. If the synergistic (various parts working together to produce an enhanced result) relationship between the elements found in the plant does not explain why Aloe Vera works, then nothing does. It is this synergistic relationship that explains why through the ages lay persons and physicians alike have proclaimed that Aloe Vera has the ability to heal, alleviate, eliminate, or even cure, a monumental list of human diseases and disorders, and therefore truly deserves the name "medicine plant." Many researchers have suggested Aloe Vera is an important modality for fighting disease. Aloe Vera has been used in both alternative & traditional medicine to aid in the healing of a variety of conditions such as: Burns, Wounds, Skin irritations, Constipation, Diabetes, Asthma, Depression, Epilepsy, Osteoarthritis, Slight to moderate psoriasis vulgaris, Alcohol-induced hepatic damage, Gastrointestinal problems. Promote normal body acid/alkaline balance. For more information on this topic see my newsletter. Support Healthy Cholesterol and Triglycerides. Increasing the body’s ability to burn fats & carbs while helping to build muscle. Aiding in the balancing of blood sugar levels. When blood sugar levels are balanced, you feel fuller longer. Supporting metabolism, suppressing appetite & preventing fat storage. Acting as a natural laxative & helping the body to eliminate food quicker. This prevents food from building up in the colon & preventing potential weight gain. Lee Ritter, N.D. (Doctor of Naturopathy) is a noted authority on the beneficial uses of Aloe Vera for the human body. Dr. Ritter’s original documentary entitled Nature's Miracle reveals the use of Aloe Vera for the treatment of AIDS, cancer, and tumors. This DVD includes interviews with the patients and doctors that were involved with research studies and case histories using Aloe vera for enhancing the Immune System. When Aloe Vera is combined with other plants it assists in even greater health benefits. Chlorella & Spirulina for detoxifying organs & strengthening the body. Acai & Goji Berry to protect against aging & skin diseases. Also to strenthen hair & nails, and protect the eyes. Ginkgo Biloba for protection from radiation & improving blood circulation. Turmeric & Ginger to aid in the prevention of cancer & gastrointestinal problems and to protect the immune system. Ginseng & Maca to help stimulate the immune system and increase energy & libido. Aloe vera has been studied as a natural food preservative. Research conducted by Daniel Valero, Ph.D., of the University of Miguel Hernández in Alicante, Spain, showed that a thin layer of aloe vera gel was highly effective in preserving foods. The researchers dipped table grapes into an aloe vera gel, then stored them at refrigerator temperatures. While untreated table grapes went bad in 7 days, the grapes dipped in aloe vera stayed fresh and tasty for as astonishing 35 days! See this article by ScienceDaily Aloe Vera Coating May Prolong Freshness, Safety Of Fruits And Vegetables for more information. Aloe vera gel can be found in hundreds of skin products, including lotions and sunblocks. The Food and Drug Administration (FDA) has also approved aloe vera as a natural food flavoring. For the discount, just type the word SOMA in the promo box of the form. For more information see my newsletter on vitamin B12. Recent studies confirm that the gastrodin in Brain Shield is one of the most powerful compounds for supporting healthy brain function at any age. To retain normal function, the aging brain relies on adequate blood flow to get sufficient oxygen and fuel. It has been repeatedly shown that formulas containing gastrodin beneficially support normal, healthy levels of brain blood flow. The body maintains a delicate balance of neurotransmitters, such as GABA, which is of tremendous importance to healthy brain function. Studies show that alone or in combination the active compounds in gastrodin help maintain healthy levels of vital neurotransmitters in those whose levels are already within the normal range. With aging, short-term memory function is often impaired. Studies show that gastrodin and other active constituents help support the healthy body's normal defenses against the mild memory problems associated with aging. Scientists have shown that the breakdown metabolites of gastrodin help provide support against the normal stress and tension of daily life. 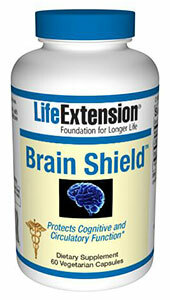 And Brain Shield helps alleviate the occasional headache associated with daily life. 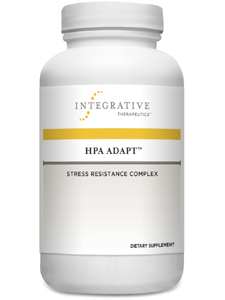 HPA Adapt is a formulation of five powerful, yet non-stimulating adaptogens shown to support a healthy stress response via the hypothalamic-pituitary-adrenal axis, or HPA axis, which is the central part of the stress response system. It involves a complex set of interactions and feedback loops between the hypothalamus, the pituitary, and the adrenal glands. This is for those under chronic stress or who are reacting adversely to stress. Glycine is an inhibitory neurotransmitter in the central nervous system. Which also helps to regulate blood sugar. 5-HTP is the intermediate metabolite of L-tryptophan in the biosynthesis of serotonin. In the central nervous system, serotonin levels have been implicated in the regulation of sleep, mood & anxiety. L-Theanine has been found in human and animal studies to increase serotonin and dopamine levels, which may promote muscle relaxation and improved sleep. L-Theanine also helps to promote alpha brain wave activity associated with relaxation. 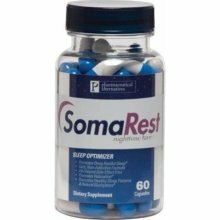 Melatonin is synthesized from tryptophan and secreted by the pineal gland during periods of darkness & is essential for sleep. 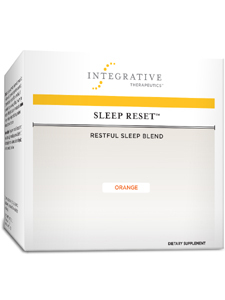 Turmeric decreases the metabolic and immunological consequences of occasional sleeplessness linked to oxidative stress and promotes antioxidant balance. Vitamin B6 is a coenzyme for many reactions within the body, including the metabolism of serotonin and tryptophan, both of which are involved in the promotion of sleep architecture. Visit our online store for over 250 Health Supplements personally selected by Dr. Slagle and used in her medical practice.